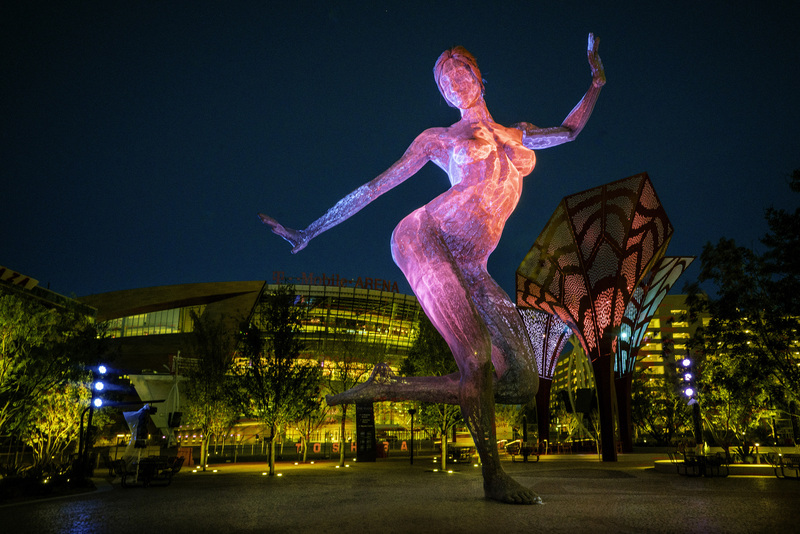 MGM Resorts International (NYSE: MGM) today unveils The Park, a vibrant outdoor dining and entertainment district celebrating the beauty of the surrounding desert landscape and offering visitors a new way to experience the Las Vegas Strip. 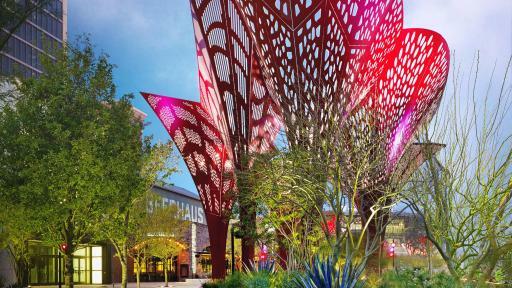 Located between New York-New York and Monte Carlo resorts, The Park is designed to become a social gathering space where guests can experience stunning design elements, a fun culinary lineup boasting great indoor/outdoor environments, iconic art and playful entertainment. The Park will serve as the gateway to the new 20,000-seat T-Mobile Arena, set to open on April 6. 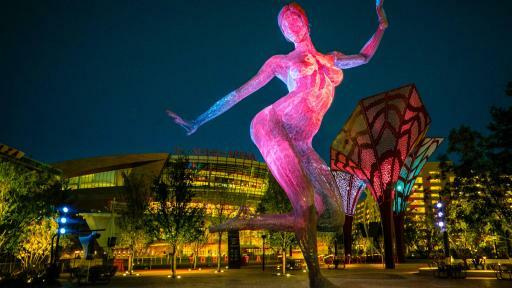 An esteemed panel is expected to join MGM Resorts’ Chairman and CEO Jim Murren in marking The Park’s official opening today, including Nevada Governor Brian Sandoval, Clark County Commissioner Mary Beth Scow and Southern Nevada Water Authority General Manager John Entsminger, who will present The Park with the Authority’s prestigious 2016 Water Hero Award. This award recognizes businesses or individuals dedicated to water conservation and devoted to saving millions of gallons of water annually. 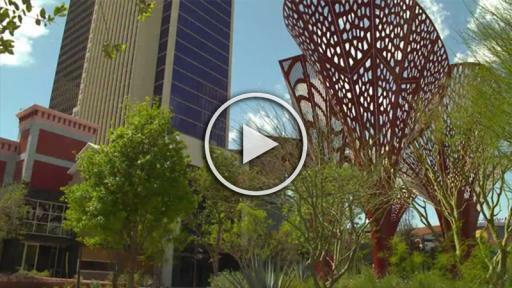 Experience: An outdoor oasis inspired by the iconic plazas, promenades and squares that have served as important public gathering destinations within the world’s great cities, The Park has re-envisioned the traditional pedestrian experience by adding a new layer of diverse social spaces in Las Vegas. 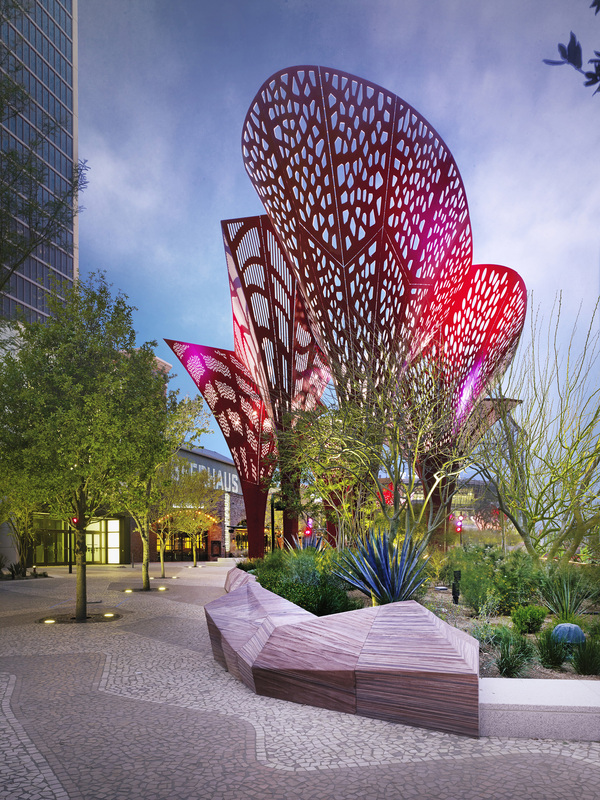 It will draw passersby from the hustle and bustle of The Strip offering opportunities to experience Las Vegas outdoors and at one’s leisure. The Park offers an array of common spaces for socializing, relaxing, exploring and sampling the surrounding tastes, sights and sounds. Dining Under the Sun and Stars: Not unlike the small cafes and bistros that spill onto iconic promenades, clusters of casual restaurants and bars with outdoor seating open onto The Park creating a colorful patio ambiance. 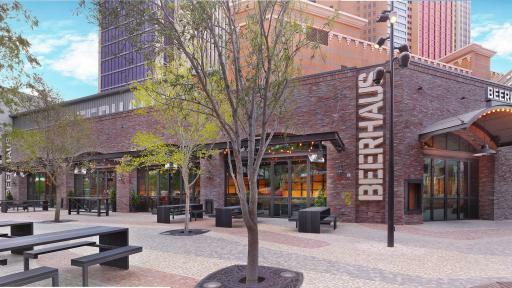 Beerhaus – A remix of the American beer hall, this fun and unpretentious beer garden is highlighted by its outdoor spaces and vantage points of all The Park’s activity. Guests can indulge in sustainably raised farm-to-table meats, an impressive regional craft brew list, live music and, of course, games to get any social gathering started – foosball, shuffleboard, ping pong and more. California Pizza Kitchen – California Pizza Kitchen is the authority in creative dining with a California vibe. Blending fresh, seasonal ingredients with bold, global inspiration, “CPK” offers signature hand-tossed, hearth-baked pizzas, inventive main plates and shareables, unique pastas and salads, alongside premium wines, craft beers and hand-crafted cocktails featuring fresh fruits, herbs and spices. With an outdoor patio, full bar and open kitchen centered around the hearth oven, CPK’s rustic, modern atmosphere is perfect for drinks and small plates before a show, dinner with family and everything in between. Sake Rok – This theatrical hotspot open for lunch, dinner and a late-night bar/lounge, thrills guests with more than just its array of delicious sushi, Japanese cuisine and private sake label. By night, Sake Rok transforms into a high-profile social dining extravaganza, immersing guests in an experience part culinary, part performance and completely unexpected. Inspired by Japan’s vibrant pop culture and fashion movements, interactive servers invite guests to partake in restaurant-wide sake bombs while doubling as entertainers, spontaneously breaking into dance and lip-sync serenades. Bruxie – The fast-casual, gourmet waffle restaurant born out of Orange County serves up its signature takes on the sandwich. Bruxie’s next-generation sandwiches use a light, airy authentic Brussels Waffle as the “Bold Fold.” The Waffle is crisp, lightly yeasty and not sweet – reminiscent of freshly baked bread. Bruxie Waffles are paired with quality seasonal ingredients, offering both savory choices like Buttermilk Fried Chicken with Chili Honey and Cider Slaw as well as a variety of sweet options such as Strawberry Crème Brûlée. 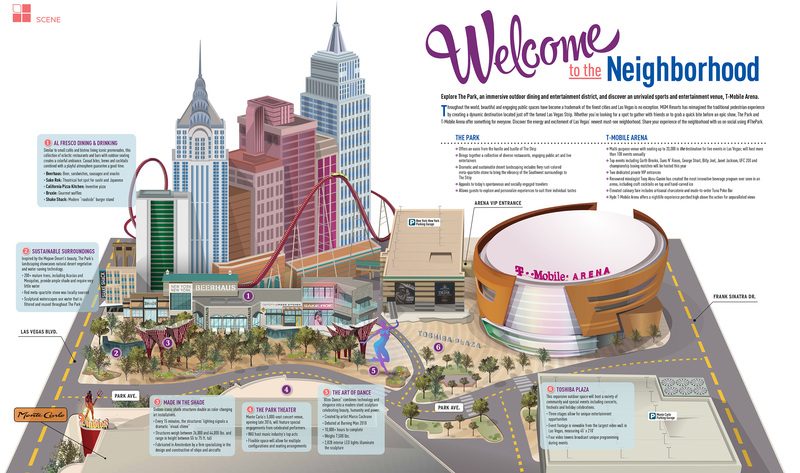 Design: The design for The Park was a collaborative effort led by MGM Resorts International with master planner Cooper, Robertson & Partners, leading landscape architecture and urban design firm !melk, and Marnell Architecture. Green Initiatives: The Park implemented an integrated environmental sustainability program throughout construction stages that will continue with operational focuses addressing energy and water conservation, green building and waste management through cutting-edge technology and innovative design. 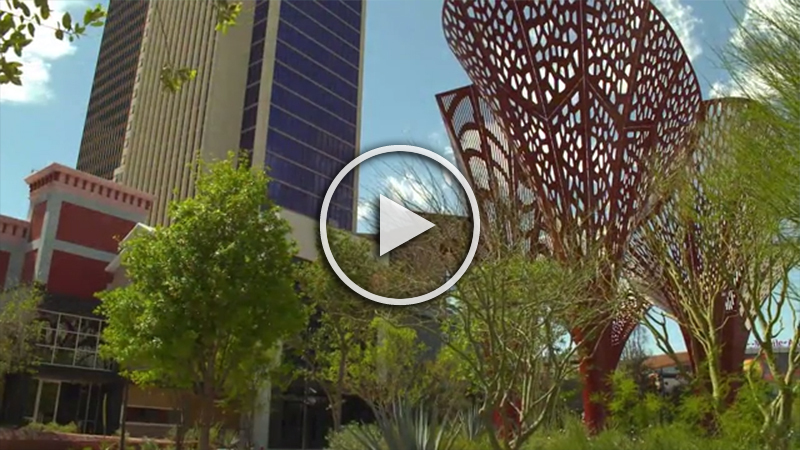 The restaurant corridor was built to U.S Green Building Council’s LEED Gold standards, and The Park also replanted 75 mature trees from the current area to enhance the lush environment. Asphalt existing on-site also was salvaged, ground and recycled to create new paved surfaces within the development and an on-site well provides all of The Park’s irrigation water. 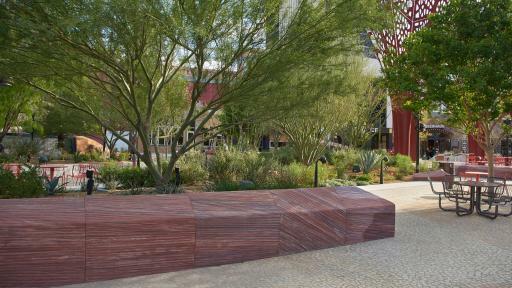 Natural Landscaping: Landscape design utilized native and desert-adaptive species of plants, which are able to thrive in hot and dry environments with minimal water. Large planters with inset seating feature dramatic plant life displays created by the juxtaposition of cloud-like plants (santolina, apache plum, mormon fir, etc.) alongside vibrant shoots (red yucca, torch lily, desert bear grass, etc. ), lush grasses (Mexican feather grass, fountain grass, orange sedge, etc.) and spikes (blue agave, golf tooth aloe, horsetail, etc.). 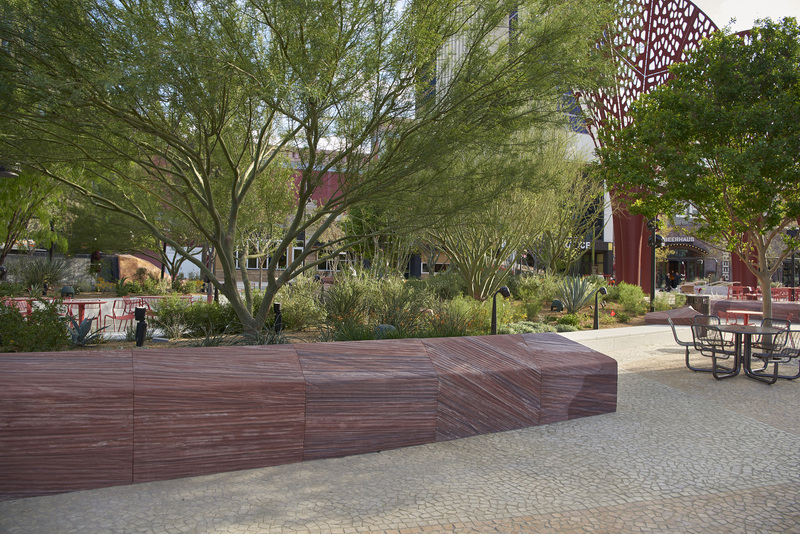 Cooling Elements: Mature trees, vegetation, water features and artful shade structures create comfortable environments for guests to enjoy The Park year-round. Ground and surfaces have been constructed using marble – a naturally cooling material. Hand-laid in mosaic tile patterns, the marble features color palettes of the American Southwest. MGM Resorts International (NYSE: MGM) is one of the world's leading global hospitality companies, operating a portfolio of destination resort brands including Bellagio, MGM Grand, Mandalay Bay and The Mirage. The Company also owns 51% of MGM China Holdings Limited, which owns the MGM Macau resort and casino and is in the process of developing a gaming resort in Cotai, and 50% of CityCenter in Las Vegas, which features ARIA Resort & Casino. For more information about MGM Resorts International, visit the Company's website at mgmresorts.com.